Explore the beautiful Bay of Islands on this 6 day roundtrip tour from Auckland. 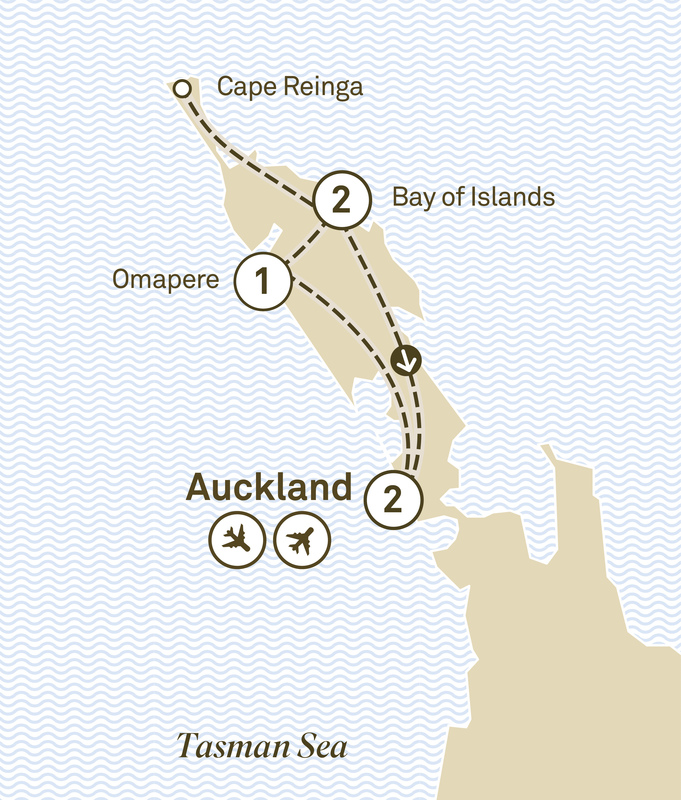 Visit Omapere, Paihia and travel to the top of New Zealand to Cape Reinga. Sub-tropical, unspoilt and fascinating; the picturesque Bay of Islands features 144 islands, incredible natural beauty and a whole lot of history. For those keen to explore a single region of New Zealand, this is the ideal itinerary. Spend time in Auckland, sampling all the experiences on offer from food and wine tasting to sightseeing before heading to the lovely Bay of Islands. Wander through giant kauri forests, learn about the history of early pioneers and choose to visit the first permanent European settlement in New Zealand, the romantic town of Russell. Cruise around the Bay or visit a lighthouse. Finish your journey at Cape Reinga, a sacred place where two oceans meet and where an 800-year-old tree stands waiting to help M-aori spirits begin their final journey home. By the time you return to Auckland you’ll be deeply moved by the splendour, spirituality and hospitality of this magnificent and mythic region. Kia Ora and welcome to Auckland for a two night stay. The wonder of New Zealand begins here. Tonight, celebrate your journey with a welcome dinner. Choose from a range of Auckland’s attractions. Enjoy an exhilarating sail on an authentic America’s Cup yacht and be part of the crew, take the helm or simply sit back and enjoy the ride as you sail Auckland Harbour. Or, explore the wine and cuisine of Waiheke Island and enjoy tastings of olive oil, wine and beer as well as a vineyard tour. Alternatively, take a leisurely morning cruise of Auckland’s beautiful harbour and see highlights including Devonport and the Harbour Bridge, or discover the Waitakere Ranges, as you walk in the lush rainforest and stroll along the black sand beaches. Or, choose to join a small group tour and discover the history and sights of Auckland. Your dining choices for tonight include a sunset dinner yacht cruise, Degree Gastrobar, Orbit 360 Restaurant at Sky City or dinner at the hotel’s Grand Millennium Brasserie. Travel north across Auckland’s busy Harbour Bridge, along the Hibiscus Coast towards the Bay of Islands. Visit Matakohe’s award-winning Kauri Museum and gain an insight into the rich pioneering history of New Zealand’s Northland region. The museum specialises in the legacy of the ancient kauri forests, specifically the strong durable timber and the highly prized kauri gum. Continue to the Waipoua Forest, an ancient green world of towering trees and rare birds, and travel past natural gateways created by huge kauri trees and the fringing of colourful ferns along the road’s edge. The sense of awe you feel as you see the mighty Tane Mahuta kauri tree for the first time is unforgettable. Listen to the interactive interpretation from your local Maori guide about the importance of the ‘Lord of the Forest’ to both the natural environment and the Maori people. Watch the sunset on Hokianga Bay with a drink on the terrace of your hotel in Omapere. Cruise the calm inland waters of the Bay of Islands with lunch included or enjoy a ferry ride to Russell, the birthplace of European settlement in New Zealand. Alternatively, discover the very best of the Bay on a scenic cruise and journey through the Hole in the Rock (weather permitting) or join a Taste of the Bay tour. Your base for the next two nights is Paihia. Travel to the very top of New Zealand – Cape Reinga. Explore the magnificent lighthouse and see where the waters of the Tasman Sea and the Pacific Ocean meet. Discover this remote and magical place of deep spiritual significance to the Maori then enjoy the thrill of travelling along Ninety Mile Beach and marvel at the immense sand dunes. Discover the birthplace of modern New Zealand at the Waitangi Treaty Grounds with a M-aori guide. See the world’s largest waka, a ceremonial war canoe, over 70 years old but still used every year on 6 February to celebrate New Zealand’s Waitangi Day. Enjoy an authentic Maori cultural performance inside the beautifully carved meeting house including a traditional M-aori welcome, waiata (singing), poi, stick games, Maori weaponry, as well as the famous haka. Head south via the city of Whangarei and arrive back in Auckland where it’s time to bid a fond farewell to your new friends and the wonders of New Zealand. On this 12 day tour from Auckland to Wellington, experience the best of New Zealand's north island. Visit the Bay of Islands, Cape Reinga, Rotorua & Napier. Take in the stunning scenery of New Zealand's South Island. Journey through the Southern Alps on the TranzAlpine before marvelling at Franz Josef Glacier. From Auckland to Christchurch, enjoy a 19 day journey through New Zealand. Visit Rotorua, Lake Taupo, Franz Josef and enjoy a Milford Sound cruise.